¬Mimic world star' voice with Voice Changer: Cool-Unique-Professional! Everyone has their own entertainment idol, so who's yours? Pop/R&B singers like Beyoncé, Justin Bierber, Katy Perry, famous politicians such as Barack Obama, George W. Bush, or even popular TV show stars and blockbuster movie characters you've ever seen. Besides owning an outstanding appearance, unique and impressive voice is also an advantage of their success. Have you ever sung along a song and tried your best imitating original singer's voice? If the answer is "YES", you definitely should know that Voice Comparator feature from online Voice Changer is all you need for a Hollywood-style voice! 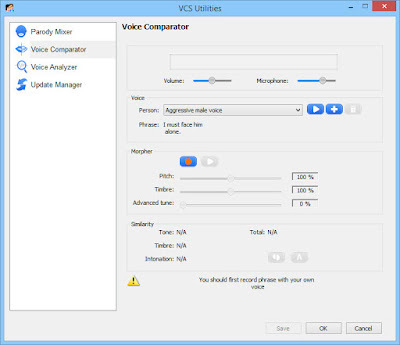 Voice comparator is a cool feature in a voice changer giving you the ability to test how similar your voice is to a target voice. All you need are a sample audio voice serving as your target voice, a voice changer and a good microphone. Step 1: Import your target voice. For example: you want to sound like Lady Gaga, Morgan Freeman, Oprah Winfrey, Jack Sparrow... import audio of that voice. HOORAY!!! Now you are as chic as these celebrities with your new voice. Let's record your own song's version and amaze your friends with how fantastic it sounds. Otherwise, you can use this changed voice to make prank calls via many VoIP application to show your chat friends how cool you are! 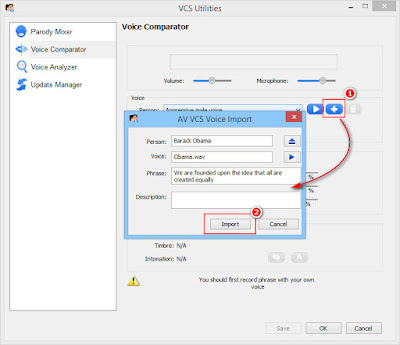 >> How to use Voice Changer for Skype, with Celebrity voice, of course. Try it, guys. Have you heard of that Barack Obama voice changer? I'm sure many of us want to make that "Obama speech" just like him with confidence and wisdom. Without a doubt, Barack Obama was and will always be one of the coolest president of the USA. But to have a voice and the ability to speak like him is not an easy task. However, there is a way right here. Voice Changer TV will show you an interesting alternative way to mimic his voice, talk to your friends and family with AV Voice Changer Software Diamond. Everyone knows President of the U.S - Barack Obama - one of the most powerful politicians in the world and an incredible leader of Americans. It's no doubt that Mr. Obama's public speaking skill, especially his unique voice is the key of his success. Speaking like Obama is becoming a hot topic now, as students gradually learn to talk like Obama, little schoolchildren are actually running around speaking English with the cadence of the president, if they’re not quoting him directly. If you are interested in his voice like me, I will bring you a cool tip to easily achieve any famous people's voices you adore, particularly the one-and-only voice of the United States President Barack Obama. ¬How to have that Obama Voice Changer? 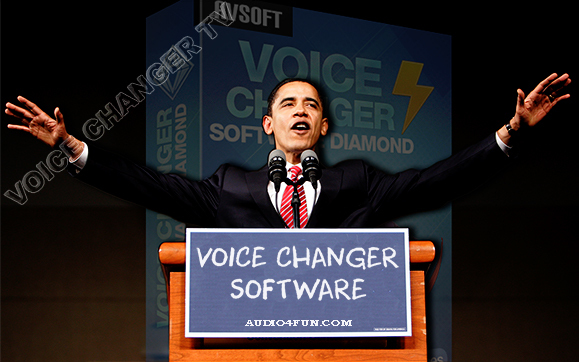 First of all, you need the best voice changer software to assist you in this voice changing task. With this software in hand, you now can modify and control you timbre and pitch, the most important parameters of a human voice. 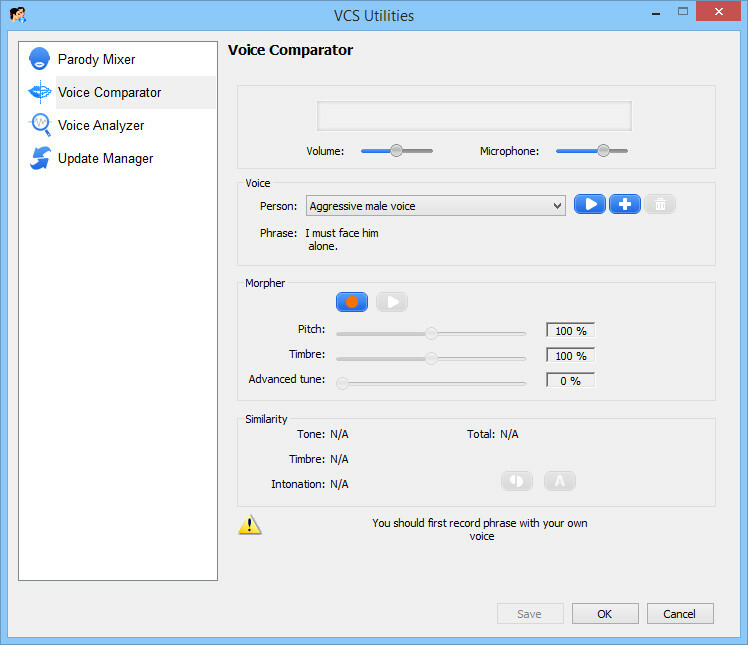 Next, Voice Comparator in voice changer software will take the most important role in this process which is analyzing and giving you the close suggestions for an exact output. Prepare a sample voice of president Obama in .WAV format. Click + button (1) to import the file into the software. Select the file and type what he says in the .WAV file into the Phrase field. The process of comparing the similarity between the 2 voices will be done automatically. Auto button (4) can help you select the best settings to have similar output to the sample. 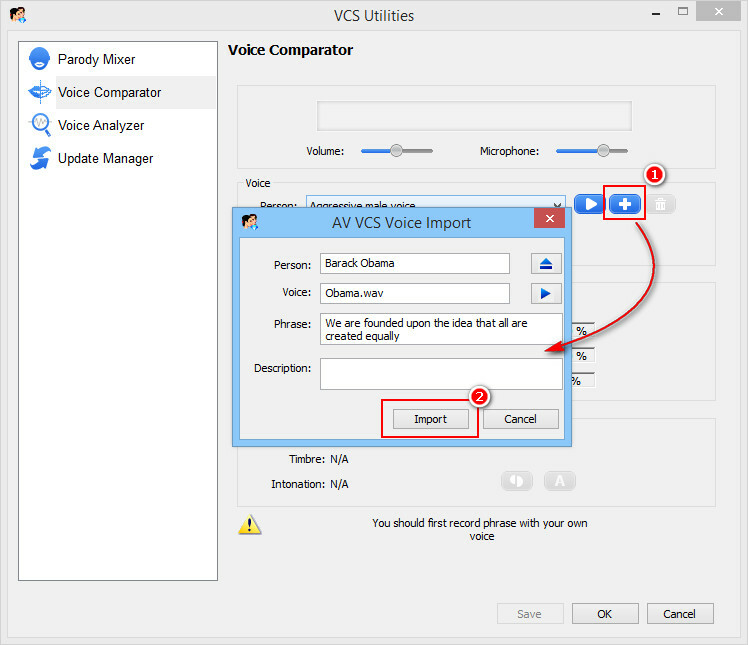 Click OK and check to see if you need to make further adjustments to get the best output voice. 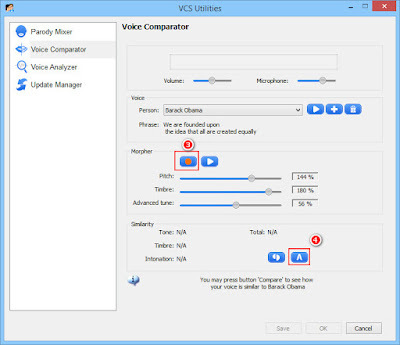 Take advantage of voice changer software's advanced settings to enhance your audio output, such as Equalizer and Sound Quality. Now, you are so ready to speak like the cool and unique voice of the president of president Barack Obama. Possibly, it can be used for E-greeting cards, narrations or epic speeches on any special occasion of the year.